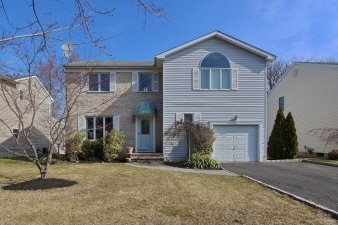 Description: ABSOLUTE MUST SEE HOME IN SCOTCH PLAINS-SPACIOUS & UPDATED MOVE IN READY CUSTOM COLONIAL-Located on a quiet tree lined cul-de-sac street in a highly desirable neighborhood convenient to everything; - top rated schools, premier shopping & NYC transportation. This special home boasts: 4 bedrooms,3 full baths,1 half bath. The floor plan is a perfect layout for comfortable living. This distinctive home features: hardwood floors, formal living room, formal dining room, gourmet eat-in kitchen w/ granite, stainless steel appliances, breakfast area w/ slider leading to the deck and backyard, family room w/ gas fireplace, master bedroom suite w/spa-like bath, large recreation room with dry bar,1st floor laundry, powder room, utility & storage room, attic, attached garage and so much more.Click Tour & Floor Plan Link.